#216. 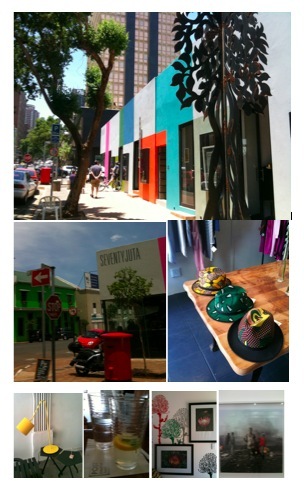 Saturday morning in brilliant sunshine we took a walk along the hip stretch of Juta Street in Braamfontein. Braamfontein’s re-imagining is more than talk and the colourful little complex of stores and offices on 70 Juta Street bears this out [It officially opened last weekend]. We started off at POST for their homemade lemonade and a tasty snack-sized prego roll. With its glass front POST is a perfect spot to sip something while observing street life (in this city of malls and walls that’s a luxury). I also warmed to the place because the music was provided by a record player and I’m a sucker for nostalgia. From there we stepped into designer Lisa Jaffe’s Guillotine pop-up store [I always find something from her label to covet] before stopping by Co-op and admiring their trademark off-kilter lamps [a yellow one is pictured below]. Designer David Tlale has moved in and there’s another cute clothing store called XXII or Twenty Two (the hats below are from there). 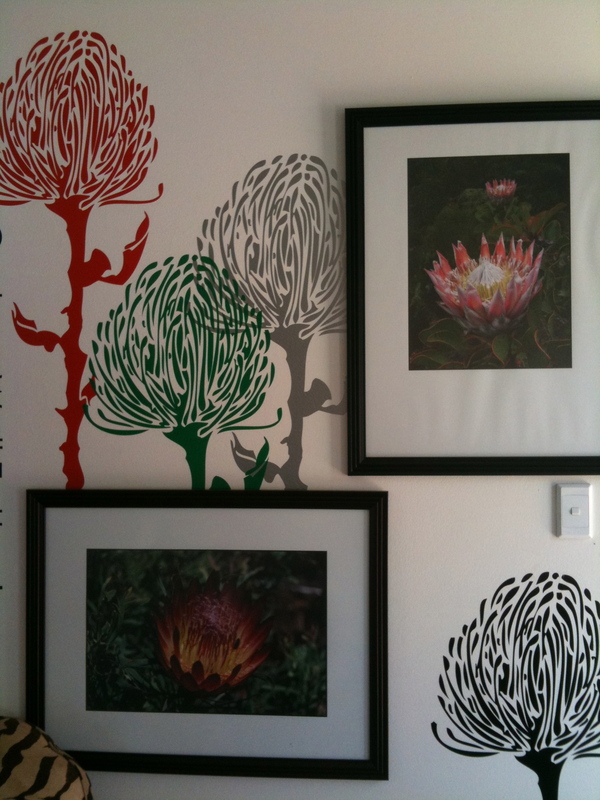 There’s also the “Lovely” flower store that specialises in custom wallpaper designs. 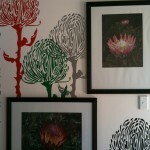 They had some great protea decals and a wallpaper that showed an Escher-style cross-section of the Voortrekker Monument. We ended off at Brodie/Stevenson‘s relocated gallery near the Queen Elizabeth bridge. It’s currently showing work by Pieter Hugo. A huge fan of his work (I was completely taken with his series on Nigerian debt collectors, the Hyena Men, and published it in Sunday Times Lifestyle as editor a number of years ago) I found this exhibition particularly bleak. Spectral figures standing amid a smoke-filled wasteland, their dead eyes staring straight through you. It’s called “Permanent Error” and in it Hugo captures the apocalyptic landscape of a technology dumpsite in Ghana on the outskirts of a slum known as Agbogbloshie.The dump is for obsolete technology. They are sad photos, uncomfortable-making because in these pictures is the result of our ever-increasing appetite for newness. And all the arguments about technology’s fruits and it’s attachment to development and a better life for all go up in smoke in this place “referred to by local inhabitants as Sodom and Gomorrah”. These people eke out a living by burning down the parts for the precious metals they contain and in so doing all is contaminated. This is not a place for humans. This entry was posted in art, design, fashion, food, gallery, Johannesburg, photography, shopping and tagged Adam Levy, Braamfontein, Brodie/Stevenson, Co-op, David-Tlale, Dokter and Misses, Ghana, Guillotine, Juta Street, Lisa Jaffe, photography, Pieter-Hugo, Queen Elizabeth bridge, Voortrekker Monument, XXII by lauricetb. Bookmark the permalink. Hey, Laurice. Love your site. I’ll put it on my blogroll.